We are pleased to announce the opening of the massive Chunuk Bair diorama in Wellington's Great war Exhibition. It shows the heroic defense of the Wellington Battalion in Gallipoli against overwhelming odds in 1915. You may have been following the beginnings of this on our Facebook page (as we started work on the figures) as well as the Mustering the Troops blog. 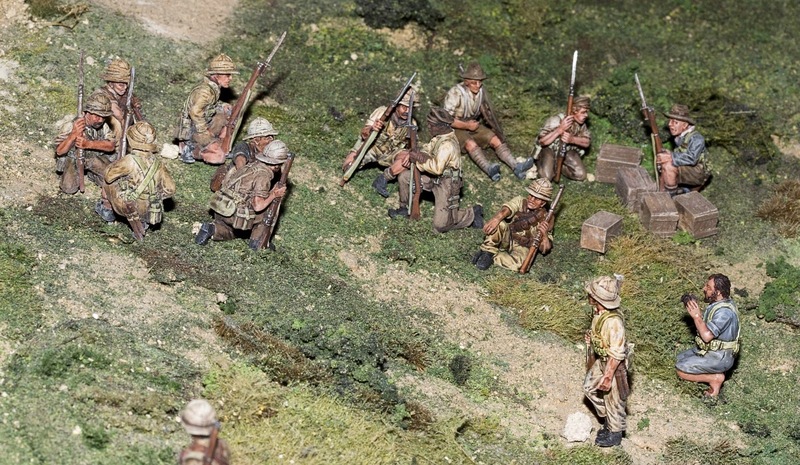 There are around 5000 54mm figures all painted by the amazing efforts of 130 New Zealand wargamers on a huge diorama created by Sir Richard Taylor's Weta Workshop. This is the centre piece in the New Zealand Room at the museum. This was all Sir Peter Jackson's vision, something that he is very knowledgeable about, having paced the actual landscape many times. It was fantastic to work with Peter, Richard, all the NZ wargame volunteers and Weta crew on such an important memorial. Ils sont fous, mais j'adore. J'ai en tête le diorama du musée d'Arromanches qui me faisait vibrer quand j'étais gamin. A quand la même chose chez nous, aux Invalides par exemple, sur Overlord, Dien Bien Phu ou Verdun ? Je suis persuadé qu'on a suffisamment de passionnés en France pour réaliser quelque chose du même acabit.